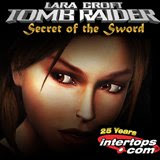 Intertops.com has added a brilliant new Lara Croft Tomb Raider game -- the most ambitious video slot ever seen in online gambling -- to their already incredible selection of online casino games. To celebrate the launch of this fantastic new interactive entertainment, Intertops.com is giving away 10 PSPs -- Sony´s newest portable model of its famous Playstation. The new “Tomb Raider - The Secret of the Sword™” video slot is a glossy 5-reel 30 pay-line multi-faceted video adventure that sets new standards in every aspect of online gaming. This outstanding game offers hours of interactive entertainment -- and the chance to hit major rewards through a variety of free spins, bonuses, wild and scatter awards and free games. The latest adventure of the intrepid Lara Croft, “Tomb Raider - The Secret of the Sword™” is a licensed concept from the globally popular series by Eidos. The new game captures the gripping excitement and suspense of the movie and video series. With unique twists and turns, it makes for a fully immersive online gambling experience. Intertops has a longstanding tradition of global customer service. As always, they welcome American players to their online casino, poker room and sportsbook. Trusted around the world for two and a half decades, Intertops guarantees easy and secure deposits and withdrawals.